Bryan Henderson is one of the most active editors on the crowd-sourced encyclopedia site Wikipedia, but remarkably he has almost exclusively focused on a single grammatical error. The majority of Henderson's 47,000 edits over the course of a decade have simply been to correct the misuse of the phrase "consisting of." Specifically, the conflation of "comprised" and "composed of" into "comprised of." Because the phrase is so common, people rarely realize that it is incorrect and should be written as "consisting of." 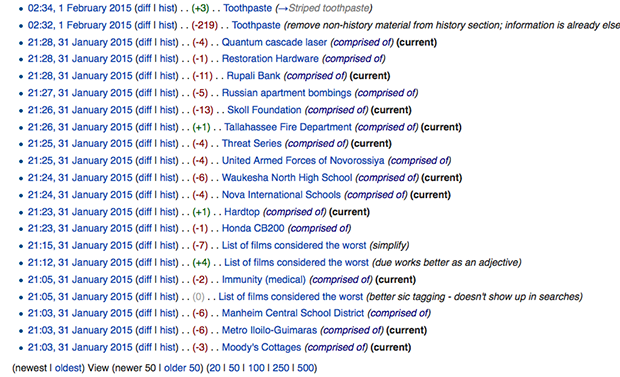 In Wikipedia parlance, Henderson is known as a "WikiGnome," which is a term of endearment for members of the community who focus on small, incremental edits without seeking attention. Read Henderson's own 6,000 word Wiki essay on the matter here.